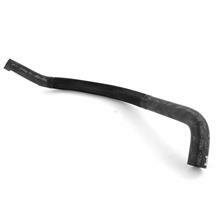 Using this 03-04 Cobra coolant hose guide, you can easily identify which hose you need to replace on your Mustang. Part numbers & pictures included! Here at Late Model Restoration, we are car enthusiasts just like you. Being the real Mustang enthusiasts, we tend to run into the same questions that our customers have from time to time. We take these questions and provide the answers to help ensure we bring our knowledge to you for quick and easy help. 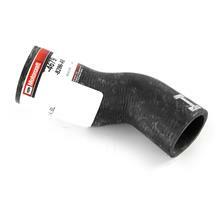 One of the common questions we get regarding the 03-04 Cobra, is the names and locations of each coolant hose. In an exploded view, it looks simple, but while still on the car, diagnosing which hose you need to replace can be tricky. 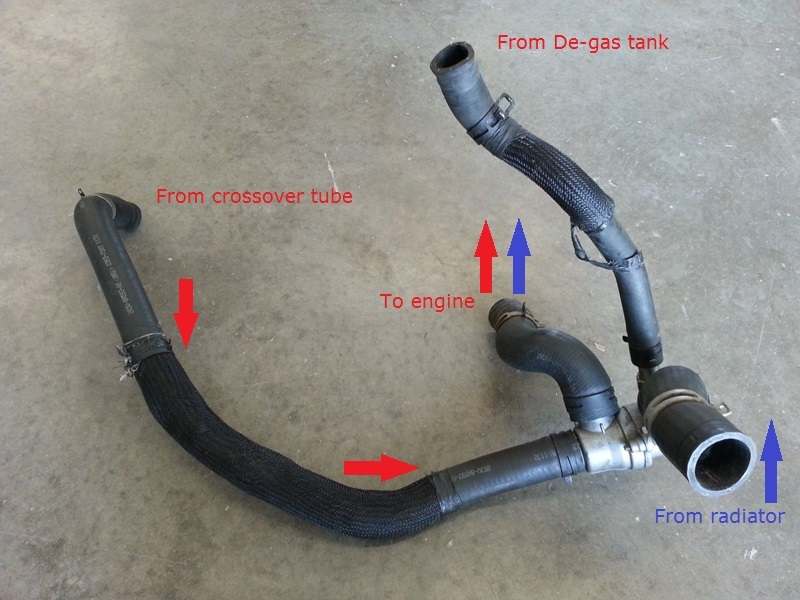 LMR has created this 03-04 Cobra coolant hose guide to help you make sense of each coolant hose on your 4.6L 4v motor to easily get the correct replacement. 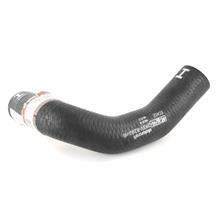 2003-04 Cobra Upper Radiator Hose To Cross Over Pipe Hose - KM4681 - This hose is located at the top passenger side of your Cobra's radiator and connects to the water bypass tube (also known as the crossover pipe). 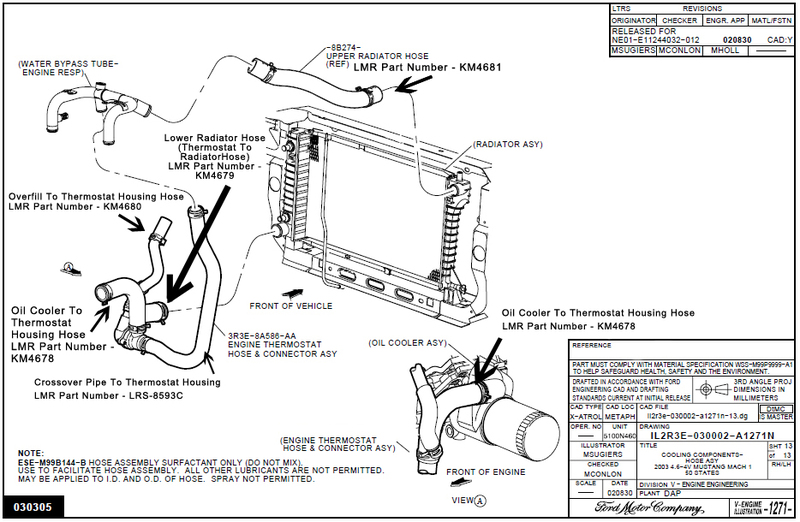 2003-04 Cobra Lower Radiator Hose/Thermostat To Radiator Hose - KM4679 - This hose is located at the bottom driver's side of your Cobra's radiator and connects to the thermostat housing. 2003-04 Cobra Overfill To Thermostat Housing Hose - KM4680 - This hose is located below your overfill tank and connects to the thermostat housing. 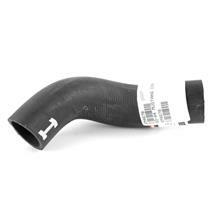 It is a slimmer hose than the upper and lower radiator hose and has 3 slight bends in the hose. 2003-04 Cobra Oil Cooler To Thermostat Housing Hose - KM4678 - This hose is located on the thermostat housing and connects the thermostat housing to the oil cooler. This hose is a wider, smaller hose and has a slight twisted curve to it. 2003-04 Cobra Crossover Pipe To Thermostat Housing - LRS-8593C - This hose is located on the crossover pipe and connects to the passenger side of the thermostat housing. 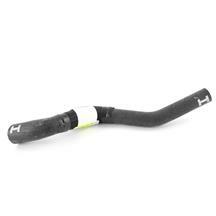 It is a slimmer hose that will be the longest of the hoses.